Clarke's First Law - Corollary: When, however, the lay public rallies round an idea that is denounced by distinguished but elderly scientists and supports that idea with great fervor and emotion—the distinguished but elderly scientists are then, after all, probably right. 'Asimov's Corollary', Fantasy & Science Fiction (Feb 1977). In collection Quasar, Quasar, Burning Bright (1978), 231. Dilbert: I think Christopher Columbus would disagree. Dogbert: How convenient that your best witness is dead. Dilbert comic strip (9 Oct 1989). [In refutation of evolution] There is not enough evidence, consistent evidence to make it as fact, and I say that because for theory to become a fact, it needs to consistently have the same results after it goes through a series of tests. The tests that they put—that they use to support evolution do not have consistent results. Now too many people are blindly accepting evolution as fact. But when you get down to the hard evidence, it’s merely a theory. From interview by Miles O'Brien on CNN (30 Mar 1996). Reported from transcript, via Nexis, in New York Magazine (15 Sep 2010). Among the studies to which the [Rockefeller] Foundation is giving support is a series in a relatively new field, which may be called molecular biology, in which delicate modern techniques are being used to investigate ever more minute details of certain life processes. In 'Molecular Biology', Annual Report of the Rockefeller Foundation (1938), 203-4. Reprinted in a letter to Science (6 Nov 1970), 170, 582. Applied science, purposeful and determined, and pure science, playful and freely curious, continuously support and stimulate each other. The great nation of the future will be the one which protects the freedom of pure science as much as it encourages applied science. In Murphy’s Law by Arthur Bloch (1977), and titled 'Murphy’s Law of Research'. Error, never can be consistent, nor can truth fail of having support from the accurate examination of every circumstance. 'Theory of the Earth', Transactions of the Royal Society of Edinburgh (1788), 1, 259. The Descent of Man (1871), Vol. 2, 385. 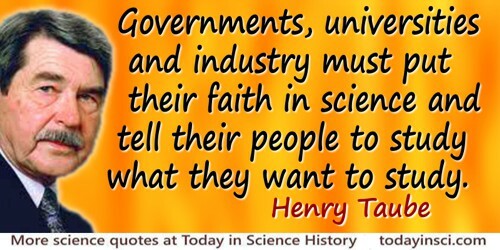 Governments, universities and industry must put their faith in science and tell their people to study what they want to study. From speech at the University of Saskatchewan, as quoted in Sean Trembath, 'Chemist Henry Taube Was Saskatchewan's First Nobel Laureate', Saskatoon StarPhoenix (5 Jan 2017). Gravitation is demonstrable by leaving a body unsupported. In Sir William Withey Gull and Theodore Dyke Acland (ed. ), A Collection of the Published Writings of William Withey Gull (1896), xlix. He uses statistics as a drunken man uses lamp-posts—for support rather than illumination. How happy … does the sagacious investigator of nature seem, whose fancy is ever employed in the invention of hypotheses, and his reason in the support of them! I am here to support the assertion that light of every kind is itself an electrical phenomenon—the light of the sun, the light of a candle, the light of a glowworm. From Lecture (20 Sep 1889) delivered to the German Association for the Advancement of Natural Science and Medicine, Heidelberg, 'On the Relations Between Light and Electricity', Miscellaneous Papers (1896), 313, as translated by D.E. Jones and G.A. Schott. I had fought on behalf of man against the sea, but I realised that it had become more urgent to fight on behalf of the sea against men. 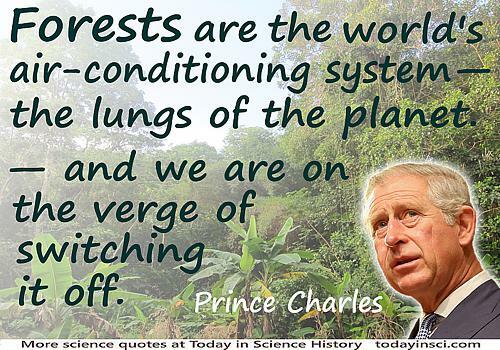 From an interview on the 50th anniversary of his voyage, when asked about his avid support for environmentalism in later years. John [H.] Van Vleck, who was a leading young theoretical physicist when I was also a leading young theoretical physicist, said to me one day, “I never have made a contribution to physics that I didn’t get by fiddling with the equations,” and I said, “I’ve never made a contribution that I didn’t get by just having a new idea. Then I would fiddle with the equations to help support the new idea.” Van Vleck was essentially a mathematical physicist, you might say, and I was essentially a person of ideas. I don’t think I’m primarily mathematical. … I have a great curiosity about the nature of the world as a whole, and most of my ideas are qualitative rather than quantitative. Interview with George B. Kauffman and Laurie M. Kauffman, in 'Linus Pauling: Reflections', American Scientist (Nov-Dec 1994), 82, No. 6, 523. Physics is NOT a body of indisputable and immutable Truth; it is a body of well-supported probable opinion only .... Physics can never prove things the way things are proved in mathematics, by eliminating ALL of the alternative possibilities. It is not possible to say what the alternative possibilities are.... Write down a number of 20 figures; if you multiply this by a number of, say, 30 figures, you would arrive at some enormous number (of either 49 or 50 figures). If you were to multiply the 30-figure number by the 20-figure number you would arrive at the same enormous 49- or 50-figure number, and you know this to be true without having to do the multiplying. This is the step you can never take in physics. 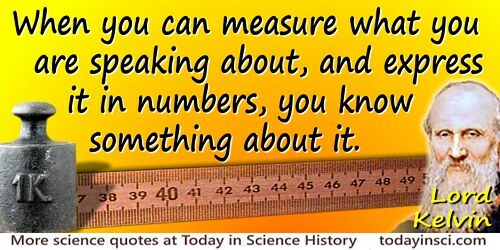 In Science is a Sacred Cow (1950), 68, 88, 179. Physics is unable to stand on its own feet, but needs a metaphysics on which to support itself, whatever fine airs it may assume towards the latter. The World as Will and Representation, trans. E. F. J. Byrne (1958), Vol. 2, 172. Science is intimately integrated with the whole social structure and cultural tradition. 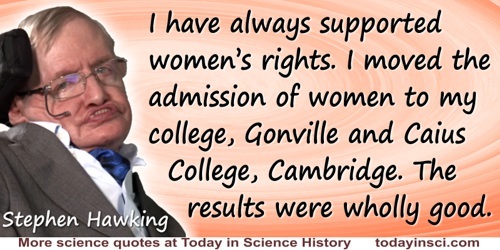 They mutually support one other—only in certain types of society can science flourish, and conversely without a continuous and healthy development and application of science such a society cannot function properly. The Social System (1951, 1977), Chap. 8, 111. As a functionalist, Parsons argued that social practices had to be studied in terms of their function in maintaining society. 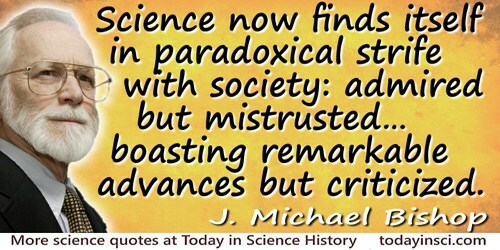 Science now finds itself in paradoxical strife with society: admired but mistrusted; offering hope for the future but creating ambiguous choice; richly supported yet unable to fulfill all its promise; boasting remarkable advances but criticized for not serving more directly the goals of society. How to Win the Nobel Prize: An Unexpected Life in Science (2004), xi. Scientific and humanist approaches are not competitive but supportive, and both are ultimately necessary. The farmer is a poor creature who skins the land and leaves it worthless to his children. The farmer is a good farmer who, having enabled the land to support himself and to provide for the education of his children, leaves it to them a little better than he found it himself. 'The New Nationalism', speech st Osawatomie, Kansas, 31 Aug 1910. In Donald Davidson (Ed.) The Wisdom of Theodore Roosevelt (2003), 18. The gradual advance of Geology, during the last twenty years, to the dignity of a science, has arisen from the laborious and extensive collection of facts, and from the enlightened spirit in which the inductions founded on those facts have been deduced and discussed. To those who are unacquainted with this science, or indeed to any person not deeply versed in the history of this and kindred subjects, it is impossible to convey a just impression of the nature of that evidence by which a multitude of its conclusions are supported:—evidence in many cases so irresistible, that the records of the past ages, to which it refers, are traced in language more imperishable than that of the historian of any human transactions; the relics of those beings, entombed in the strata which myriads of centuries have heaped upon their graves, giving a present evidence of their past existence, with which no human testimony can compete. The Ninth Bridgewater Treatise (1838), 47-8. 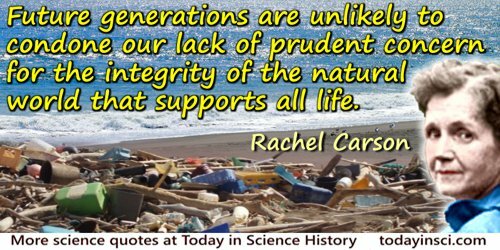 The oceans are the life support system of this planet, providing us with up to 70 percent of our oxygen, as well as a primary source of protein for billions of people, not to mention the regulation of our climate. There is not a “pure” science. By this I mean that physics impinges on astronomy, on the one hand, and chemistry and biology on the other. And not only does each support neighbors, but derives sustenance from them. The same can be said of chemistry. Biology is, perhaps, the example par excellence today of an “impure” science. In 'Abstract' The Impurity of Science (19 Apr 1962), the printed version of the Robbins Lecture (27 Feb 1962) given at, Pomona College, Claremont, California, as published by Ernest O. Lawrence Radiation Laboratory, University of California. The Demon-Haunted World: Science as a Candle in the Dark (1997), 30. This study was supported by NSF MBS75-14268 and inspired by paying 95 cents for a rotten avocado. In 'Why Fruits Rot, Seeds Mold, and Meat Spoils', The American Naturalist (Jul-Aug 1977), 111, No. 980, 707. 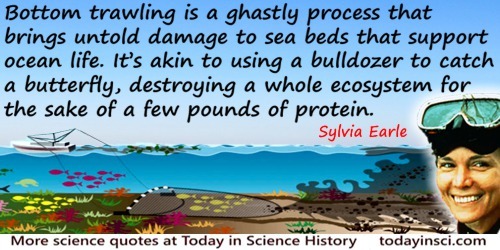 The author suggests that food spoilage is the result of microbes competing to keep the resource to themselves by engendering the rotting process to repel larger animals from consuming the food item. Three hundred trout are needed to support one man for a year. The trout, in turn, must consume 90,000 frogs, that must consume 27 million grasshoppers that live off of 1,000 tons of grass. From Energetics, Kinetics, and Life: An Ecological Approach (1971), 293. To say that, a scientific man puts forth a theory and, supports it and adheres to it, not because he thinks it true, but because he wishes it to be true, is the same thing as saying that he is not a seeker after truth at all, and is therefore a traitor to his profession. In Reason and Belief (1910), 136. Water must be thought of in terms of the chains of life it supports. In Silent Spring (1962), 46. We are fast approaching a situation in which nobody will believe anything we [physicists] say in any matter that touches upon our self-interest. Nothing we do is likely to arrest our decline in numbers, support or social value. When the disease is stronger than the patient, the physician will not be able to help him at all, and if the strength of the patient is greater than the strength of the disease, he does not need a physician at all. But when both are equal, he needs a physician who will support the patient’s strength and help him against the disease. Whether or not you agree that trimming and cooking are likely to lead on to downright forgery, there is little to support the argument that trimming and cooking are less reprehensible and more forgivable. Whatever the rationalization is, in the last analysis one can no more than be a bit dishonest than one can be a little bit pregnant. Commit any of these three sins and your scientific career is in jeopardy and deserves to be. Honour in Science (1984), 14.